Metallic airway stenting is an important and commonly performed technique in interventional bronchoscopy. After a brief historical overview, this chapter reviews the currently available metallic airway stents. The indications for metallic stent insertion are considered, including central airway obstruction and aerodigestive fistula due to malignancy, posttransplant airway anastomotic problems, and the controversial issue of metallic stent insertion in benign airway obstruction. Selection and assessment of appropriate patients for metallic stenting are discussed, together with the question of choosing an appropriate stent size and type. The potential role of more sophisticated methods of pre-procedure work-up, such as EBUS, ultrathin bronchoscopy, and dynamic CT, is examined. 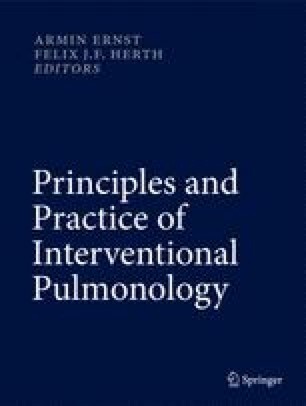 The different methods of stent insertion are considered in detail, with a discussion of the pros and cons of rigid vs. flexible bronchoscopy, and the possible variations in technique arising from choices of airway adjunct, anesthesia, deployment visualization, and post-insertion dilatation. The author discusses methods of follow-up after metallic stent insertion and the impact of stent placement upon symptoms, exercise performance, and lung function from published case series. The principal complications of metallic stent insertion are described, together with advice about possible techniques for their management. Finally, techniques for the very difficult procedure of removal of metallic airway stents are considered, together with advice about appropriate referral to a major center in case of difficulty. The author would like to thank Laurence Pengelly who provided the stent photographs reproduced here. Gerry Slade, an experienced bronchoscopy nurse, provided expert advice, support, and encouragement. FDA Public Health Notification: Complications from metallic tracheal stents in patients with benign airway obstruction at http://www.fda.gov/MedicalDevices/Safety/AlertsandNotices/PublicHealthNotifications/UCM062115 (2005). Accessed 10 Oct 2010.